FILE - Chinese naval soldiers are pictured manning their stations on China's first aircraft carrier Liaoning, as it travels towards a military base in Sanya, Hainan province. Chinese officials say Beijing has 'maintained great restraint' and not moved to recover islands and reefs 'illegally occupied by neighboring countries'. Beijing says it will oppose attempts to make its island-building activities in the South China Sea the focus of this week's leaders' summit in the Malaysian capital. China's vice foreign minister told reporters on Tuesday the leaders' meeting at the Association of Southeast Asian Nations (ASEAN) summit is no place for territorial disputes to be raised. Liu Zhenmin said that even though Beijing does not want the East Asia Summit to hype the South China Sea issue, it is inevitable other countries will raise the issue and China will respond. The United States, Vietnam, the Philippines and other nations have expressed alarm at China’s rapid island-building in the South China Sea, arguing that Beijing is trying to assert its disputed claims without discussion in international forums such as ASEAN gatherings. U.S. President Barack Obama, in his meetings at ASEAN, “will continue to urge all claimants in the South China Sea to halt further land reclamation, construction of new facilities, and militarization of features they occupy, in order to reduce tensions and create diplomatic space for lasting, lawful and peaceful solutions to emerge,” according to a White House statement. China, earlier this month, successfully blocked a joint statement of ASEAN defense ministers amid disagreement over how to refer to the maritime dispute. “They (China) would generally attempt to block it at every similar kind of meeting whether it’s of defense officials, foreign ministers or heads of state. So I would expect the same kind of dynamic to be taking place, mostly behind closed doors, at this upcoming meeting,” said Denny Roy, a senior fellow at the East West Center in Hawaii. 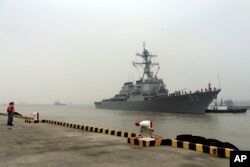 FILE - Chinese Navy personnel stand guard as guided missile destroyer USS Stethem arrives at the Shanghai International Passenger Quay for a scheduled port visit in Shanghai, China, Nov. 16, 2015. China reiterated its assertion that Washington is “taking sides in the South China Sea issue” after a pair of U.S. Air Force bombers flew near artificial Chinese-built islands in the disputed waters. ASEAN members Brunei, Malaysia, the Philippines and Vietnam also have claims to parts of the South China Sea. The 27th ASEAN Summit in Kuala Lumpur – Wednesday through Sunday --includes the organization's dialog partners, most prominently China, India, Japan and the United States.